Marathon? Fun? Why, yes. It IS possible. I've run 8 marathons. Now that doesn't make me a pro by any stretch of the imagination. However, overtime I've run a marathon I've had a goal in mind. *Complete my first marathon* *sub4hours* *PR* but it's taken me a long time to come to the place where I run a marathon for fun. And you know what? I freaking LOVED it! Leave your Garmin at home and while your at it, leave your music at home too. That way you can experience everything the marathon has to offer. Time doesn't matter in this case. Completion and FUN matter most. When you're in it for fun, it's easy to smile the entire way. 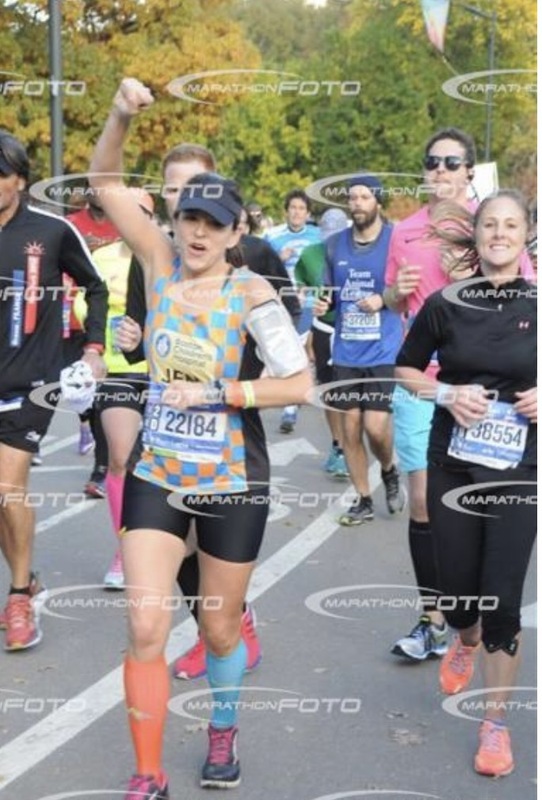 I felt like I had a smile plastered on my face for the entire 26.2 miles at NYCM. 3. Take in the sights. If you're choosing a marathon for fun, I'm pretty sure you'll choose one that is exciting. You know, like NYCM? You know the feeling after a marathon where your legs don't work anymore? Going down stairs is impossible! Going pee? OMG! BUT, seriously. After NYCM, I didn't hurt at all. Well, compared to other marathons. And if your legs aren't hurting, you can definitely pull off a Jump Joy Monday, of course, while wearing your medal! High five the heck out of the crowd! The kids, the adults. Everyone! It's an amazing feeling. And when you aren't high-fiving spectators, practice your fist pump every time you see a photographer. I'd like to hear from you! Have you run a marathon for fun? Tell me your favorite part!